All of us find ourselves, at one time or another facing the unexpected and asking 'How did I get here?' Whether because of disappointments in love, crises in health, family or finances, professional dissatisfaction, or events beyond your control, life doesn't look like you expected or intended it to. In this program Barbara De Angelis teaches you how to use whatever you're going through as a springboard for regeneration and rebirth. 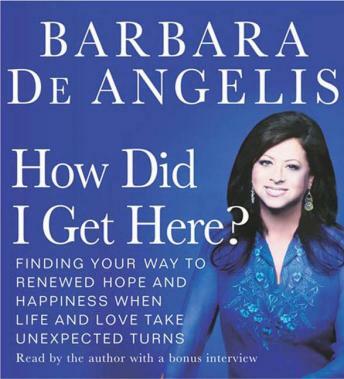 Written with Barbara De Angelis' trademark eloquence, honesty and compassion, and containing the treasures of her own thirty-five year quest for enlightenment, HOW DID I GET HERE is a more than uplifting, intimate and moving--it is a true transformational manual for achieving emotional and spiritual rebirth that will change your life.